I’m in the process of reading The Four Pillars of Investing (an excellent book, by the way) and I thought I’d share with you some of William Bernstein’s insights into investing. According to Bernstein, you really only need guidance in two areas: asset allocation and self-discipline. And how should you go about learning about these things? He then goes on to list the books that he recommends for inclusion in your new reading program. 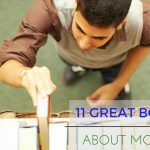 Given that I recently put together a rundown of the best books about money based on the opinions of a handful of other bloggers, I thought I’d likewise publish a list of Bernstein’s favorites, many of which I haven’t read (and a few of which I’ve never even heard of). Well, I would argue that if you read the first two books, you wouldn’t have to read any other book about investing at all. The first two should convince you that the only thing you should do when it comes to the market is invest in an index mutual fund. I agree that for the large majority of investors, this is what you should do. But for a few like me, that like doing the homework of picking stocks, there can be good rewards there.